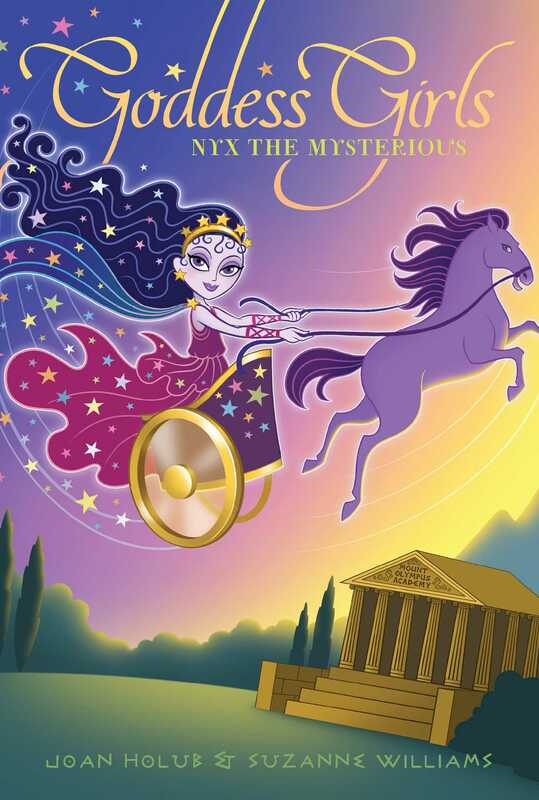 NYX, THE TWELVE-YEAR-OLD GODDESS OF the night, hovered high in the dark velvet sky in her horse-drawn chariot. With both arms, she began reeling in the starry blue-black cape that currently stretched overhead like an enormous canopy. Darkness was giving way to the dawn of morning, and people on the ground far below were beginning to wake up. But it was Nyx’s bedtime. She let out a big yawn. After she finished her job here, she would normally go home and sleep the coming day away, awakening in the afternoon to hang out and do stuff. Then, toward evening, she’d fly back up in the sky to expand her cape and darken the heavens once more. However, this day was going to be totally different from usual. And she might not get any sleep at all! As she continued to expertly tug at her cape and fold it smaller and smaller, Nyx spotted Eos, the rosy-fingered goddess of the dawn, entering the sky below. Graceful as a dancer, Eos waved her arms, sending glistening rays of pink, purple, and orange to fan out along the horizon. The goddess, who Nyx figured was about her same age, wore a bright saffron-colored robe embroidered with lovely flowers. Which was pretty much the exact opposite of Nyx’s outfit—a dark plum-colored gown studded with winking stars. By now Nyx’s expansive cape had magically shrunk to the size of a pillowcase. She gave it a few final folds to form a neat square no bigger than a sandwich, and then tucked the cape into the pocket of her gown. Picking up the reins of her chariot, she shot another quick peek at Eos and then looked away again before Eos could catch her watching. The two of them had never spoken, and Nyx sometimes wondered if Eos was afraid of her. Many people were. Eos was sooo lucky. Because everyone loved the dawn, Nyx thought with a twinge of envy. Night, however? Not so much. It was kind of frustrating that mortals and immortals alike didn’t understand or appreciate her as much as they did Eos. Just why the soothing darkness her cape provided should inspire fear in some was something she’d never understood. To her, night was cozy . . . and necessary. It was a time of rest and renewal. A time to dream. Simply thinking about sleep caused her to yawn again, even bigger. Her purple gaze flicked to Eos and she froze. Because this time, Eos’s pale eyes were looking her way, too! The goddess of the dawn had caught her mid-yawn with her mouth wide open. Nyx quickly snapped it shut. How embarrassing! For half a second, their eyes met. She had a weird feeling Eos was about to say hi or start a conversation or something. What if she made a friendly joke to Nyx about the yawn? How would Nyx answer? She didn’t know how to be funny back! Startled, Nyx quickly looked away and pretended to get busy with the reins. She always felt shy around people she didn’t know well. Time to get out of here! “Home, Erebus!” Nyx urged her horse quietly. As the colors of dawn replaced the night, he pulled her purple and gold star-studded chariot lower in the sky. Down, down, down they went. No sooner did the horse’s hooves touch the earth than . . . crack! The ground magically split open. Erebus skillfully sailed down through the crack and took Nyx and her chariot into Tartarus, the deepest place in the Underworld. A mist-shrouded stone palace loomed on the misty path ahead. Her home. The moment her horse and chariot landed beside the black wrought-iron fence that surrounded the palace, Nyx leaped to stand in a patch of ground covered with fragrant star-shaped white flowers. They were called asphodel, and great fields of them grew in the Underworld, where little else would grow. “Back in a few, Erebus,” she murmured, giving her horse a quick hug. Tiny blinking stars followed in her wake as she dashed through the wrought-iron gate, up the walkway, and through a polished ebony wood door. Inside the palace, her footsteps echoed across the black-tiled great room and down a hall. Within minutes, she burst into her favorite place in the whole castle—her bedroom! She had painted its walls a lush midnight blue and studded its ceiling with white stars that could magically rearrange themselves into various constellations. It was so cool! No one else had ever seen the room though. Because the only friends she had in the Underworld were either shades, aka the dead, aka human souls. Or else they were guys like Hypnos and Thanatos, the twin gods of sleep and death who helped check in newly deceased arrivals to the Underworld. Due to her nighttime job in the sky, it wasn’t like she could ever have a sleepover even if she had friends her own age around here! Zooming straight to her canopy bed, Nyx shoved open the heavy black brocade curtain that enclosed it. After pulling her folded square cape from her pocket, she dropped it into the travel bag she’d packed earlier and left atop her bedcovers. The bag was stuffed with a week’s worth of clothes—pairs of black leggings, some black chitons, and her black cotton nightgown as well as makeup, money (though she wasn’t sure she’d need that where she was going), and other belongings. She yawned again. Argh! She had to shake off her tiredness. She had places to go and immortals to see! We are writing to tell you that we won an essay contest celebrating an “unsung hero.” That is, a hero whose good deeds aren’t well-known enough to be celebrated in any songs. And guess what? Our essay was about you! Principal Zeus said we could invite you—our unsung hero—to visit Mount Olympus Academy for a week, so immortals can meet you and celebrate your good deeds. We hope you will come! You can bring your cape and do your job in the sky every night from here, no problem, right? Nyx could hardly believe that the two mega-awesome goddessgirls Athena and Artemis had written to her, much less that they considered her a hero! The essay they’d sent told of how, under cover of Nyx’s darkness, the mortal Odysseus (a definite hero) was able to sneak home after the Trojan War and reclaim his estate. This was true, but it wasn’t like Nyx had provided the darkness specifically to aid him. She’d simply been doing her job! Night was a great concealer of actions. Another of its beauties was that it allowed what was done by day to be undone. Which was how, as Athena and Artemis’s essay had noted, Odysseus’s wife, Penelope, was able to thwart unwanted suitors. Thinking Odysseus dead in the war, they had hounded her to marry one of them. But she told them she first had to finish a special weaving. She worked on it every day. Then, while the suitors slept during the night Nyx brought forth, Penelope tricked them by undoing her work. Here again, Nyx’s nightly help had been merely accidental, though. Real heroes like Odysseus did great things on purpose. What if Zeus or other immortals at MOA realized she really wasn’t a hero after they met her? Would Athena and Artemis soon regret their invitation? Nyx poked the two scrolls into her bag. They were too long to fit, so she left the bag partly open with the scrolls sticking out of the top. Her stomach fluttered uneasily. The moment she had both dreaded and looked forward to during the last few days had finally arrived. She was going to Mount Olympus Academy. Although she felt anxious, she was determined to show up. Because despite doubting whether she deserved to be called a hero, this could be her best chance of educating immortals about the importance of night and how little they had to fear from it (and from her)! She grabbed her bag in one hand and dashed off. Reaching the palace entryway, she screeched to a halt and lifted a tall dome from a table with her free hand. About three feet tall and two feet wide, the dome had a handle on top and was draped with a cloth. Quickly she tied a cord around its middle to keep the cloth in place. As the chariot lifted on a path that would take her out of the Underworld, she gazed up at the narrow slice of sky that showed through the crack in the earth overhead. She could just make out the last of the dawn’s faint pink glow as it gave way to the blue sky of morning. Although pink wasn’t at all her, it was the perfect color for the bright and pretty Eos, who probably would have fit right in at MOA. Better than Nyx, anyway. Just before Erebus burst out of the Underworld, carrying her and her chariot with him, Nyx heard a flapping sound, like a flock of bats. Her horse must’ve heard it too because he bucked nervously. “Whoa, boy!” she soothed. After gaining control of him, she frowned and looked around. Seeing nothing amiss, she flew on, never noticing the shadowy stowaways that had zoomed into the chariot as it rose up from Tartarus. After folding their wings, they slipped into the opening at the top of her bag and huddled together, as quiet as death itself.